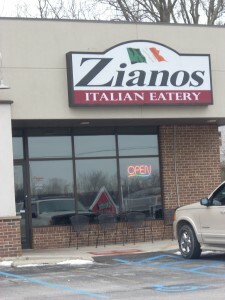 Posted on February 26, 2013 at 8:50:28 am by Kayleen R.
If you’re in the mood for great Italian food in a casual atmosphere at reasonable prices, check out Ziano’s on Covington Road at the intersection of Covington and Jefferson Blvd. My sisters had recommended it, so when it came time to celebrate family birthdays, Ziano’s was where we headed on a recent Sunday for lunch. “The garlic breadsticks are to die for,” one sister said while the other nodded her head in agreement. Service was prompt for our table of eight. Our orders included Appetizers, including two plates of breadsticks with five on each. Everyone in our party wanted at least one of those luscious breadsticks with garlic butter and cheese sauce for dipping. 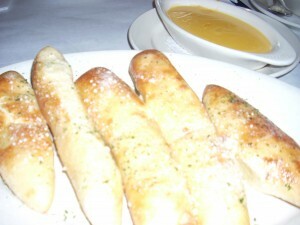 They were warm and soft and everything a person could want in a breadstick. They were also gone in 5 seconds as our table of diners quickly devoured them. Most amazing is that five of these thick garlicky breadsticks are only 99 cents!